For the most breathtaking views and spectacular adventures, work your way through this list of the best Yosemite hikes. From Zion to Joshua Tree, and Arches to Acadia, there are so many incredible hikes waiting to be explored. But, California may just have the best adventures awaiting in Yosemite. Whether this is your tenth trip or your first, make sure you've check out all ten of these Yosemite trails. Remember as you embark upon your trekking journey to be well prepared. This means stocking up on water, charging your phone, and having solid snacks ready. It is always important to sign in to trail heads as well. This both provides proof of foot traffic for more restoration and conservation projects, as well as safety if you go off trail. So, with the safety bit out of the way, let's dive in the best Yosemite hikes that I've found. I’d so excited to start out describing the best Yosemite hikes with the Mariposa Grove of Giant Sequoias. It has been closed since 2015 for restoration, but is hopefully opening up in the spring of 2018! So, if you’re planning your Yosemite hiking trip in the next few months, put this on the list of must do trails. As of now, just the outer loop trail is open. You will be able to spot quite a few of the majestic sequoias, but it is a trek to get to this trail. To access it, it's a rigorous twelve mile round trip trail hiking from Wowona Road. But, I would recommend waiting for the more exciting trails to reopen and getting a spot at the new parking lot and renovated restrooms. There will also be a shuttle from the South Entrance to the grove running soon enough. The new restoration will be must more durable for visitors and have numerous trails navigating the spectacular grove. The Four Mile Trail is hands down one of the best Yosemite hikes. Connecting two of Yosemite's most popular spots, Glacier Bay and Yosemite Valley, this is a stunning trail. You will get views of the infamous El Capitan and Half Dome, as well as a full view of Yosemite Falls. Don't let the name fool you, the trail is actually 4.8 miles one way, and 9.6 round trip. If you'd like to keep it short, make sure to shuttle your cars for the one-way hike. To get to the trailhead, you can take the El Capitan tram to stop E5. The hike up will be relatively strenuous, but you will have unique view around every corner. This is a highly trafficked hike, but there is so much to explore that you won't feel crowded. This is a spectacular hike for those of you who like to hang out and pause along the way. A five mile hike lined with granite benches, Illilouette Falls will take you up along cascading waters. Spring and early summer will be the best time to visit, as vivid wild flowers will be popping up along the water as well. You will have numerous views along this Yosemite day hike, including many east Yosemite Valley attractions, such as Vernal and Nevada Falls, North Dome, the Royal Arches, and Half Dome. Don't let the name fool you, either, but you will actually not have a perfect view of Illilouette Falls on this hike. If you'd like to add a little extra adventure to your day, you can tack on another mile to get to Panorama Point. If five miles is still not enough, keep going and meet up with the Mist Trail for a here to there hike of 8.5 miles. Whatever way you choose, Illilouette Falls will prove to you it is hands down one of the best Yosemite hikes. As the name states, you will get to experience not one, but two breathtaking waterfalls on this hike. The are best seen April through June due to the snow melt. But, make sure to bring a rain layer along if you'd like to hang out in the mist. The full hike, seeing both Vernal and Nevada Falls, will be seven miles round trip. For a less intense option, you can head up just to Vernal Falls for three miles total. This is one of the best Yosemite hikes that can be done in a day, so plan to get out early to beat the crowds. The views of the falls, as well as Liberty Cap and Half Dome and intensely popular, but well worth it. You can continue hiking up to Half Dome as well. I would encourage you to hike down the Muir Trail, as every step will show you a new angle of nature's beauty. Remember to bring your camera to capture all the memories you make as you explore the best Yosemite hikes. When you finish your hike, head a mile west to Curry Village. There, you will find a great bite to eat at one of the many restaurants. The name of this trail simply beckons you to come check it out. A moderately trafficked seven or eight mile hike, Cathedral Lakes is an absolute dream. Two pristine lakes are set amidst the backdrop of, you guessed it, mountain tops that look like cathedrals. The first lake is at mile seven, with the second lake at mile eight. This is the perfect spot to have a long picnic, hang out with your friends who braved the trail, or have a gorgeous photo shoot. While you will find a decent amount of people on this trail, I can promise you that those who choose to hike to here are fantastic fellow adventurers. Just a heads up, it is part of the John Muir trail, which is a very popular backpacking route. There is camping at the lakes, but the sites fill up fast, so register early. Also, before you head back down, make sure to head west at the second lake to look over to Tenaya Lake as well. So, you'll get views of three lakes and a more laid back crowd. Sounds like this trail was a no-brainer to add to our best Yosemite hikes list. A 13.4 mile hike, Rancheria Falls will definitely be a full day hike in Yosemite National Park. However, with three sets of falls to view and even some cliffs to jump off, this will be well worth the work it takes to get there. The waterfalls are named Tueeulala, Wapama, and Rancheria Falls. They will be most spectacular during the snow melt. The parking will be at the O'Shaughnessy Dam, where there is a backpackers only campsite as well. After a mile or so of easy, wide trail, it will transition to what your typical hiking trail. This trail is moderate with a solid amount of switchbacks and incline, so prepare for that. But, this trail will keep you away from the Yosemite Valley crowds and give you a full day of exploration. Just another reason to pick one of these best Yosemite hikes. No best Yosemite hiking list is complete without a solid hike for all skill levels. Tanaya Lake is a 3.4 miles out and back that is wonderful for a light walk or an afternoon of birding. The beginning is usually a bit wet, so prepare with good shoes or be ready to take them off. Aside from that, the trail is best in May thru October, and many people have still had snow capped mountain views through July. For those of you trying to figure out how to get your beach bum to Yosemite, this is a great option. Strolling to the east end of the lake, you will find a soft sand beach to lounge in the warm rays. But, leave them there as you venture to the west for the stunning view back across the lake with the granite backdrops. If the name doesn't beckon you to climb it, then maybe the above view of Yosemite Valley will. 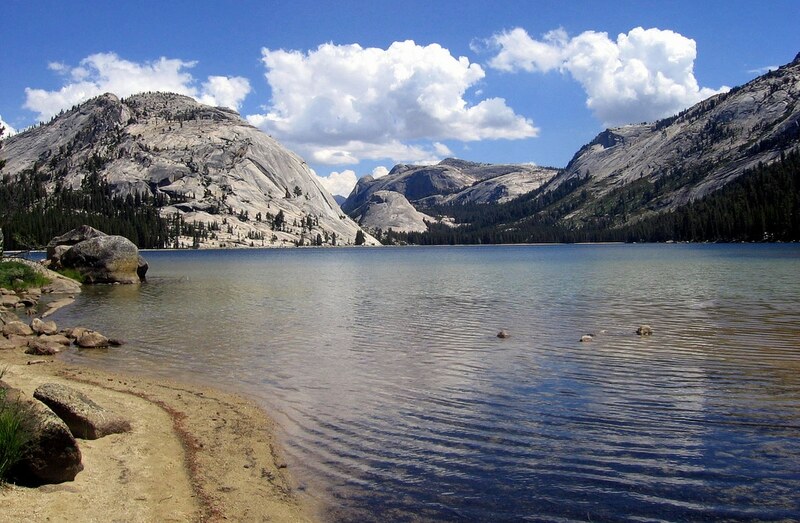 While it can be accessed from Tenaya Lake, it is most well known for it's trail coming up from the valley. On this 19 mile hike, you will gain over six thousand feet in elevation. But, the view from the top will give you the best view of Half Dome in the park. This hike is varied from long, slow inclines to steep steps and switchbacks. With the high intensity of this hike, make sure to bring plenty of snacks and water. If possible, bring a water filtration system so that you don't run out. You'll find a good amount of fellow adventurers on your way, but they're all excited and determined if they're joining you on this epic trek. The most demanding and famous of best Yosemite hikes, Half Dome is well worth the work. From atop the most majestic Yosemite landmark, you will have panoramic views of the valley and national park. This hike comes with options. The longest is via Tenaya Lake at 23 miles, the shortest is 14.2 miles via the Mist Trail. But, you can split that up into two days by getting a wilderness permit and hiking in to Little Yosemite Valley campground. This hike is clearly one of the best Yosemite hikes. But, due to the high volume, there is now a permit lottery system for the infamous cable ascent. This route takes you up the last four hundred feet on a long cable and 2x4 ladder. If you are lucky enough to get the permit, make sure you're prepared with gloves, grippy shoes, and water. It's not a bad idea to hit the gym before hand as well, as it can be a long way up. I would even recommend clipping yourself in as you go. Even if you believe in yourself, there are plenty people above you who may be dropping things as well. Don't let this cable ascent scare you. Hiking Half Dome is by far the most breathtaking of these hikes. The beauty found at the top is unsurpassed and humbling. So, look up that lottery and start hoping. Whether you want a stroll through the waterfalls or the hike of a lifetime, you've now seen the best Yosemite hikes that I've found. With the hustle and bustle of life, work, or school, you can't help but want to escape to nature and marvel at it's beauty. 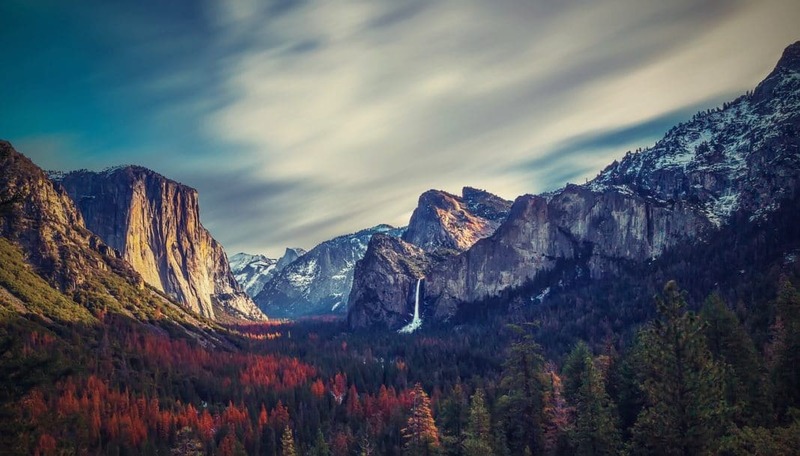 Yosemite National Park is a phenomenal place to do just that. But, remember as with most things beautiful, they can also be dangerous. So, please be prepared with a map, water, snacks, and a well rested and excited hiking buddy. So, enjoy your planning and I'll see you out there to explore the best Yosemite hikes! Previous articleIs It Safe to Travel to Mexico? Here’s the Scoop. Lauren Nowack is a trekbible writer and story maker from Pine Valley, California. She and her husband work in the recreation department at a camp. In their free time, they enjoy mountain biking, building out their Sprinter van, and adventuring with their new puppy, Shadow.